The Yakima Valley is one of the most important hop growing regions in the world, and the craft beer industry wouldn’t be what it is today without our Valley’s hop growers. Though millions of people enjoy the beer that our hops help produce, most people don’t know the first thing about hops and how they are used to create that beer. Check out our FAQ that will help you get a better understanding of how hops are grown, harvested and processed, and how they are used in the beer brewing process. SO WHAT IS A HOP? Humulus Lupulus (hops) are the flowering cones of a perennial climbing vine (called bines) that is primarily used in the beer brewing process. Hops have been used in brewing since the early days to ward off spoilage from wild bacteria, and to bring balance to the sweetness of malts. Hops also help with head retention (the foam on your beer), act as a natural filtering agent, and impart unique flavors and aromas, including (but certainly not limited to!) the bitterness in beer. WHY ARE SO MANY HOPS GROWN IN THE YAKIMA VALLEY? 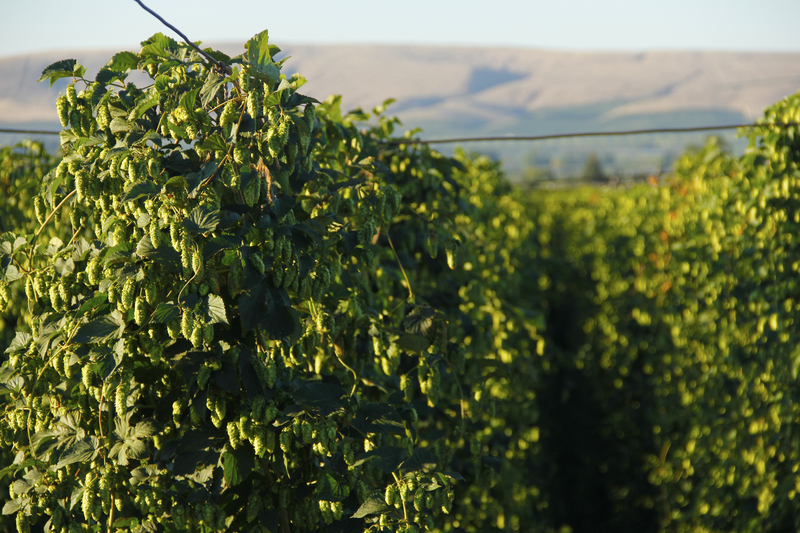 The Yakima Valley has proven to have the ideal combination of the right climate, day length, soil and access to irrigation systems for hop growing, which is why over 75% of our nation’s hops are grown here. WHAT PART OF THE HOP IS DESIRABLE TO BREWERS? The female hop cone, which forms on the bine in late summer, contains various oils and alpha acids that are essential for the flavor and aroma in beer, especially the hop-forward beers such as IPA’s. Peel open a fully-formed hop cone and you can check out the sticky yellow lupulin glands inside, the active ingredient in hops that give each variety its own flavor and characteristic. Around the Yakima Valley, the annual hop harvest generally starts towards the end of August and lasts throughout most of September. Most picking facilities run 24 hours-a-day, 7 days-a-week, for close to 30 days. DO HOPS HAVE TO BE REPLANTED EACH SEASON? No, hops are a perennial climbing vine that remains dormant underground throughout the fall and winter. The plant begins to grow from the ground each spring as the weather warms. ARE HOP CONES HANDPICKED FROM EACH HOP BINE? ed though the row by a tractor called a top cutter, which cuts the top of the bine from the trellis. The harvested bine is transported back to the picking machine in the back of the hop truck. SO NOW THE BINE IS IN THE BACK OF A TRUCK. THEN WHAT? Each bine is hand-loaded (upside-down) into the picking machine. Many of the local picking machines have been around since the 1950’s, and are still going strong! WHAT HAPPENS IN THE PICKING MACHINE? After the plant material is stripped from the bine, a series of belts and sorting mechanisms separate the hop cones from the other plant material. A conveyor belt then transports the cones from the picking machine over to the kiln. A KILN, YOU MEAN LIKE AN OVEN? Yes. At harvest time, hops contain roughly 75% moisture. If stored with that amount of moisture throughout the year, they would spoil. Hops are dried in a hop kiln to an ideal moisture content of about 9-10%, allowing them to be stored and used in brewing throughout the year. HOW ARE HOPS PACKAGED WHEN THEY LEAVE THE FARM? After the hops are dry and cool, they are compressed into 200 pound, burlap-wrapped bales. Truckloads of bales are delivered to warehouses at hop processing companies around the Yakima Valley, where they will be packed into smaller bales of raw hops, or processed into pellet and extract form. 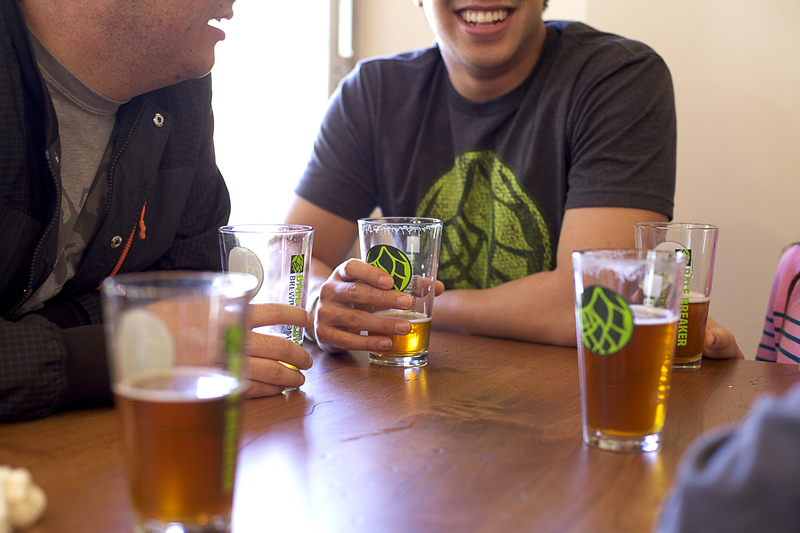 These hop processing companies act as the middle-man between the farmer and brewer. Once the hops have been processed and repackaged, they are shipped to breweries all around the world, ready to be made into delicious beers of all kinds! SO WHAT DOES THE BREWER DO ONCE THEY GET THE HOPS? It depends on the type of beer they are making, but generally, hops are boiled with a malt sugar solution (called wort), and then yeast is added to begin fermentation. The hops’ bitterness counteracts the malt’s natural sweetness, creating a nice balance of flavors. Adjusting the amount of hops versus the amount of malt will give you different types of beer. Obviously a lot more work goes into brewing your favorite beer, but that is the basics. So the next time you’re sipping on a delicious, hop-heavy IPA, you can tell your friends you know exactly where those hops came from, and how it went from a plant to a beer! And if you really want to experience Yakima Valley hops at their freshest, makes plans to come to Yakima for the Fresh Hop Ale Festival, the first weekend in October every year. All the beers at the event have to be brewed with Yakima Valley hops that went from the bine to the beer within 24 hours. You’ve never tasted beer so fresh! Thanks to Bale Breaker Brewing for the beautiful photos! The Yakima Valley has made it through yet another hop harvest. 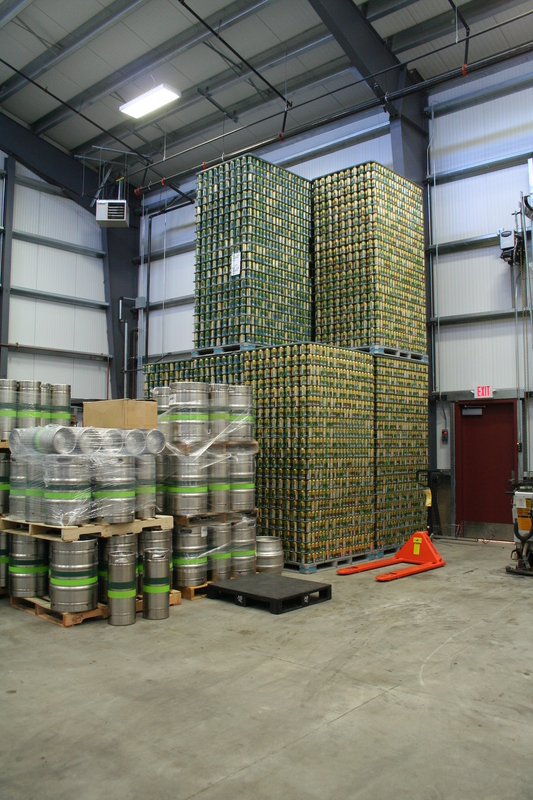 Gone are the lush green walls of hops, stretching 18 feet in the air. In their place is a forest of bare hop poles, pieces of cut twine still dangling from the wires. Now our Valley’s hops take the next stage of their journey, where they’ll be preened, pressed, pounded and processed into dry hop pellets for brewing in the coming year, while a small amount of still wet, fresh-picked hops are packed off to breweries to make their one-of-a-kind Fresh Hop beers. Even though it looks the same as it always does after a successful harvest season, it doesn’t tell the real story: that this was definitely not just another hop harvest. Growers throughout the world struggled this year. Germany experienced their worst hop harvest in over a decade, down 27 percent from last year. Britain was below their average. New Zealand was short. And here at home, the Yakima Valley went through one of the most difficult growing seasons in recent memory. We faced three straight weeks of triple-digit temperatures. We had a non-existent snowpack, leaving our Valley strangled by drought. And we continue to have a stunted labor force, which extends harvest times, creating more work for less people. But despite these challenges, our growers prevailed. The 2015 harvest is on par to outstrip last year’s bounty by a solid five percent. The overall yield of hops is actually down from last year, but there was more than 3,300 new acres of hops planted this year in Washington, which more than made up for the decline. The resilience and tenacity of our farmers has done our Valley proud once again, and everyone from growers to brewers to beer-lovers can breathe a sigh of relief that this difficult harvest is successfully behind us. So to our hardworking Yakima Valley hop farmers and laborers, we offer a sincere and heartfelt “Thank You” for all that you’ve done this year. If there’s ever anyone who has deserved a beer after a long day’s work, it’s you. Bale Breaker Brewing production areaAs summer comes to an end, the fields and orchards are abuzz as the crops are brought in and processed. Harvest is a great time of year in the Yakima Valley along the trail. Hops and other crops that make our ciders, spirits and wines are being picked and headed to production. With the exceptionally warm and dry summer, many crops in the Yakima Valley are ahead of schedule. The wine grape harvest began in early August when Chardonnay grapes were picked for Treveri Cellars for their sparkling wines. Now other wine grapes are coming online and the crush is underway earlier than usual and for a longer period. When it comes to expansion plans, Bale Baker Brewing Company is mirroring the harvest this year: It’s coming sooner than expected. Last week the owners announced plans to add 16,200 square-feet of space to their existing 11,000 square-foot operation near Yakima. This will give them more space for larger fermentation tanks, a bigger canning line plus space for dry and cold storage. “We’re in the midst of planning out our expansion now, which kind of surprised us because we weren’t planning to fill out this facility for probably five to seven years,” co-owner Kevin Quinn told the Yakima Herald in a feature on the expansion. Congrats to the gang, all of us look forward to your continuing success. Meanwhile, on the West end of the Yakima Valley region, Bron Yr Aur Brewing Company outside the town of Naches is barreling along to a September opening (we hope!) Follow their progress via their Facebook page. In the meantime, you can stop by and enjoy their pizzas (love the BBQ pulled pork) plus the local and regional beers and ciders they have on tap in their adjoining restaurant. Wishing you all a wonderful Labor Day weekend. Keep the firefighters battling the wildfires in your thoughts and prayers. Had a chance to swing by Hop Nation Brewing Company’s soft opening last week during the First Friday event in downtown Yakima. Pardon the pun, but things were hopping! Owner Ben and crew were serving a nice crowd with the brews while HopTown Wood Fire Pizza was there baking up their 9″ pies of delight. 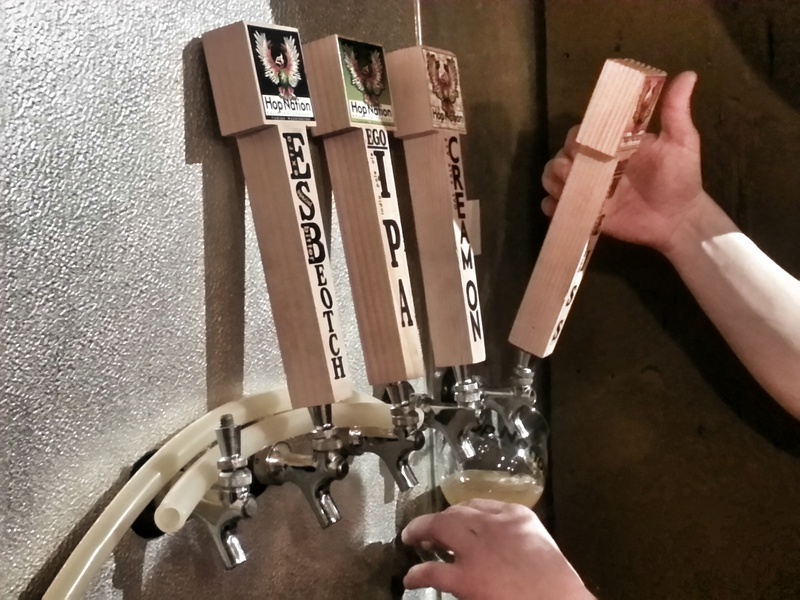 On tap was ESBeotch, EGO ipa, Cream On-oat pale ale and Weiss, a German Hefeweizen. Had a chance to try the Weiss and it delivered a smooth, mild wheat flavor you’d expect. Pints are $4.00 but when a train rumbles buy you get 50 cents off. Also tried a slice of the HoppDaddyDo from HopTown pizza. With Italian sausage crumbles, pepperoni, Roma tomatoes, fresh mozzarella, basil and their signature pinch of hops it delivered a spicy and tasty complement to the beer. 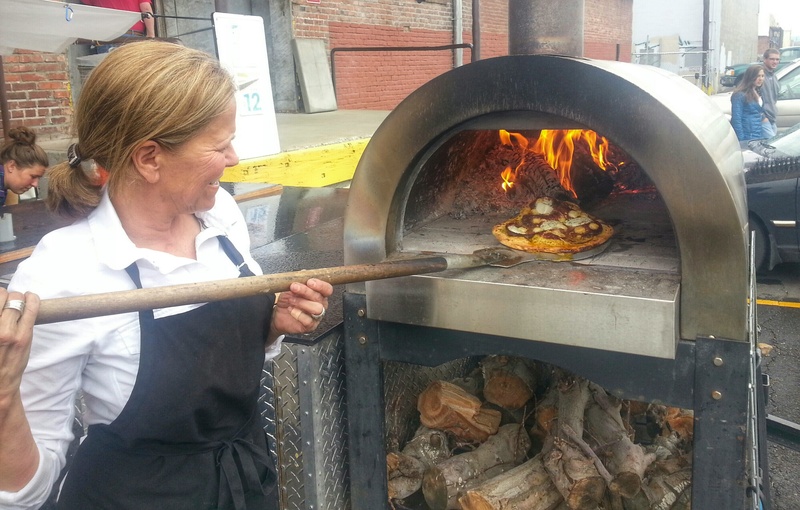 Hop Town Pizza is serving their wood fired pizzas Wednesday-Saturday 4 p.m.- 8 p.m. in the old Track 29 parking lot for Hop Nation guests and walk ups (31 N. 1st Avenue. 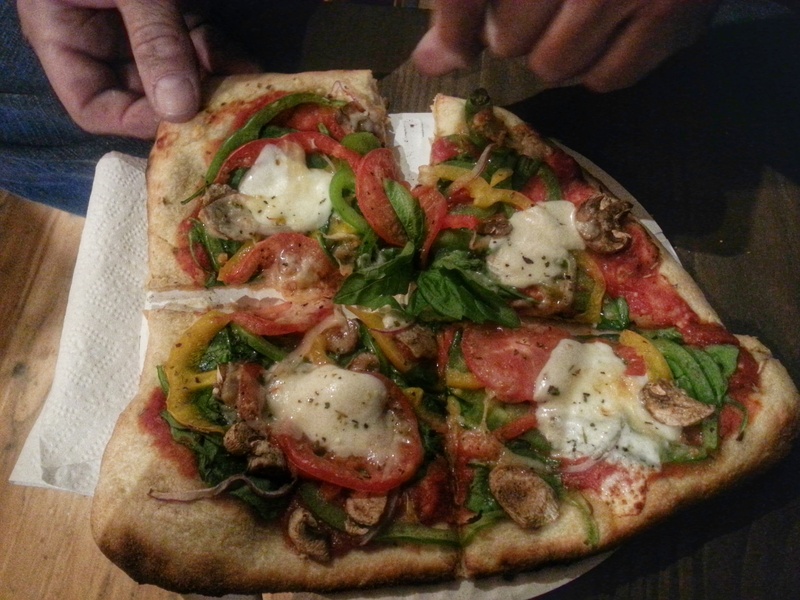 Look for the big wood fire oven and friendly staff). Another gem in the downtown craft beverages along the Spirits and Hops Trail! See you there. Hoppy days are here again! According to an article in Saturday’s Yakima Herald, in 2014 U.S. hop growers produced their largest crop in five years. Even so, they could not keep up with the international demand for craft beer. Last year featured a 10% increase in acreage but low yields and high prices, according to statistics released last week by the Hop Growers of America. Rising prices and crop size have been driven by the growth in craft beers, which need more hops and a range of flavors. Washington state’s Yakima Valley produces about 77 percent of the nation’s hops. Check out the full article here. Here’s to another banner year! The popular cable show Beer Geeks was in town this week filming our wonderful hop fields and the harvest. According to the producer David Page, the footage will be part of a segment on Northwest based breweries. As David told us, they’ll be telling the story of the Yakima Valley hops and it’s importance to the beer industry. We’ll keep you posted on when the segment will air. 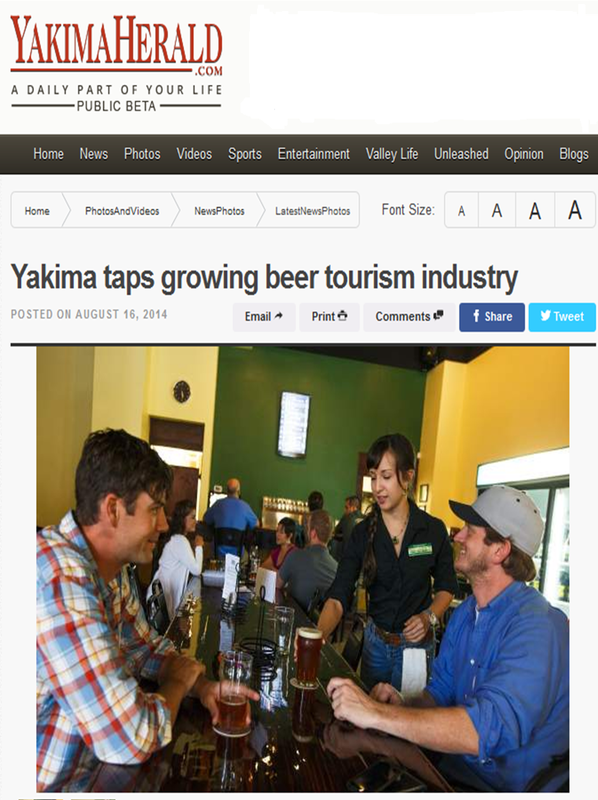 In the meantime, here’s to enjoying Yakima Valley hops in all the craft beers you enjoy! Come enjoy the harvest by visiting the Spirits and Hops Trail. It’s a busy season here in ‘hop central’, also known as the Yakima Valley. Harvest is coming and the bines are full of fragrant hops ready for cutting. The word at the brew pubs in the Valley is that it’s been a great summer with visitors coming from near and far. 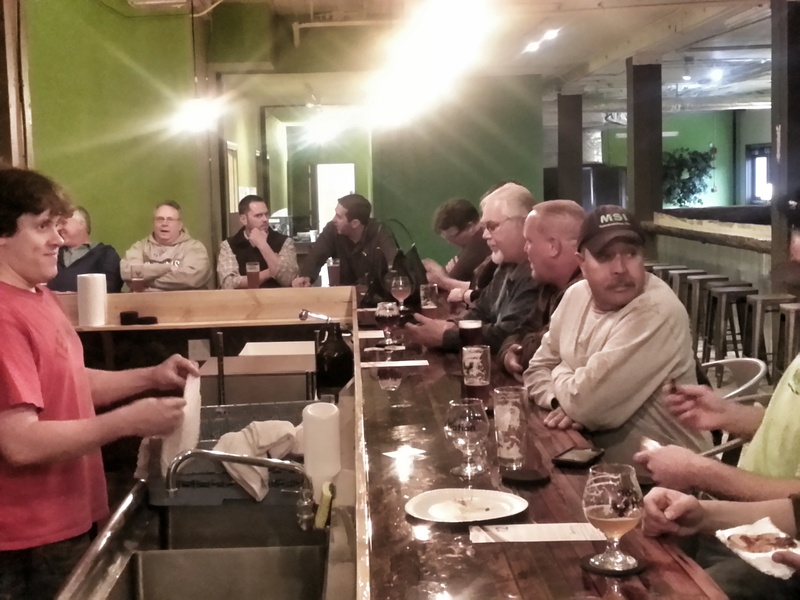 I was in Yakima Craft’s new tasting room downtown Saturday and the place was packed! Our local paper did a nice write up about their opening and our efforts to build beer tourism with the Spirits and Hops Trail. And SmarterTravel.com did a shout out to the trail in a piece they wrote last month titled America’s Best Small Cities on the Rise. Pretty cool huh? The United States saw an ever-higher number of new breweries enter the market in 2013, with a record-high 3,699 active ‘permitted breweries’ overseen by the Alcohol Tobacco Tax and Trade Bureau (TTB). An analysis by the Beer Institute showed that the majority of the 948 new permits issued in 2013 went to brewpubs. The Beer Institute analysis showed that four states account for one-third of all breweries in the United States: California, Washington, Colorado and Oregon. “We have tracked the industry since our preceding trade association was first founded in 1862, and there’s a story in these numbers. Beer is constantly evolving in the U.S., with more small brewers than ever before, more brands being introduced by national brewers and growing interest in imports,” said Chris Thorne, vice president of communications at the Beer Institute. The Beer Institute’s 2012 Beer Serves America study demonstrated the industry’s economic power. The study concluded that beer puts more than two million Americans to work, from farmers to factory workers, and brewers to bartenders. The combined economic impact of brewers, beer distributors, retailers, suppliers and other inducted industries was calculated to be $246.5 billion in 2012. The industry paid $49 billion in federal, state and local taxes that same year. “There was a long period of consolidation in the industry, but during that same period, beer became the most popular drink in America. Thanks in great part to the small brewer tax credit, today we’re seeing more small brewers than ever before. But consumers are also increasingly less loyal to beer, and that is a challenge for every brewer of any size,” Thorne said. Under the existing tax structure, small brewers (defined by U.S. Tax Code as those that produce up to 2 million 31-gallon barrels per year, or the equivalent of 110 million six-packs) receive a substantial break on federal excise tax, paying only $7 per barrel on the first 60,000 barrels. The regular tax rate is $18 per barrel, which is paid by all brewers of more than 2 million barrels, all beer importers regardless of size, and on every barrel produced by small brewers beyond 60,000. More than 90 percent of permitted breweries today produce less than 60,000 barrels annually. The Beer Institute is the national trade association for the American brewing industry, representing both large and small brewers, as well as importers and industry suppliers. First founded in 1863 as the U.S. Brewers Association, the Beer Institute is committed today to the development of sound public policy and to the values of civic duty and personal responsibility: http://www.BeerInstitute.org. 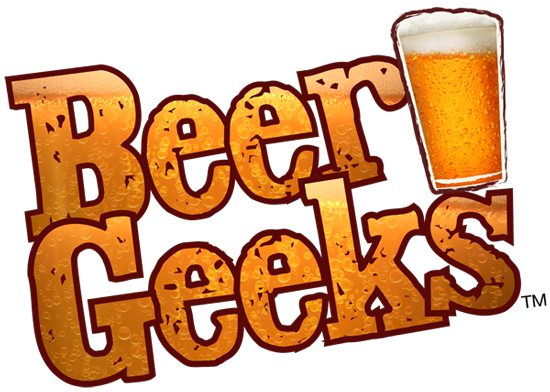 Connect with us @BeerInstitute and on Facebook. As the Super Bowl approaches and millions of fans cheer with a cold beer in hand, we thought we’d share some beer facts. Super Bowl Sunday is the second-largest day for consumption of food and drink for Americans, behind Thanksgiving Day. According to the Nielsen Company research, 51 million cases of beer will be sold to quench Super Bowl fans. We have no data on how many of them will call in sick Monday morning. Not surprisingly, antacid purchases are estimated to increase by 20% the day after the big game! Beer is big business in the U.S.A.- It’s a $246 billion industry, includes more than 2,800 breweries and 2 million jobs (Beer Institute). There are more breweries in the U.S. than any other country in the world. Which state consumes the most beer? According to the Beer Institute North Dakota at nearly 46 gallons of beer per capita per year. The least? Utah at just over 20 gallons per capita per year. Washington state is near the bottom of the barrel (bad pun) at 24.8 gallons. Beer consumption has changed in recent years, with craft beers growing in popularity while mass produced beverages are declining. Check this article from Yahoo Finance online. Craft brewers currently provide an estimated 108,440 jobs in the U.S., including serving staff in brewpubs. Growth of the craft brewing industry in 2012 was 15% by volume and 17% by dollars compared to growth in 2011 of 13% by volume and 15% by dollars. Craft brewers sold an estimated 13,235,917 barrels* of beer in 2012, up from 11,467,337 in 2011. The craft brewing sales share in 2012 was 6.5% by volume and 10.2% by dollars. Craft brewer retail dollar value in 2012 was an estimated $11.9 billion. As of March 18, 2013, the Brewers Association is aware of 409 brewery openings in 2012 (310 microbreweries and 99 brewpubs) and 43 brewery closings (18 microbreweries and 25 brewpubs). 2,347 craft breweries operated for some or all of 2012, comprised of 1,132 brewpubs, 1,118 microbreweries and 97 regional craft breweries. So enjoy the big game (GO SEAHAWKS) with your favorite beer. And while you’re at it, give a nod to the Yakima Valley in Washington, because no matter what beer you drink, there’s a 78% chance that the hops in your brew came from here. Cheers! This blog is a reprint of an article by Capital Press, posted with their permission. YAKIMA, Wash. — U.S. hop production was up 13 percent from 61.2 million pounds in 2012 to 69.3 million pounds in 2013, according to the National Agricultural Statistics Service. The crop was valued at $249 million, up 28 percent from a revised 2012 value of $195 million, according to a Dec. 23 NASS report. The average price per pound was $3.59 up from $3.18 a year ago and $3.14 two years ago. All of this shows the industry, centered in Washington’s Yakima Valley, is doing very well and probably will be for the next two to three years, said Pete Mahony, director of supply chain management and purchasing for John I. Haas Inc., Yakima, a leader in hop processing, research and development. Oil in the hop cone or flower is used for flavoring and stabilizing beer. Expansion of small, craft breweries is driving the hop increase, Mahony said. Craft breweries continue to increase in number and size, he said. Craft brewers make up only 7 to 8 percent of the brewing industry but have a 15 percent annual growth. Large brewers comprise the bulk of the industry but average 1 to 2 percent annual growth, he said. Haas opened a new multi-million dollar center for hop research and development in Yakima in June. It includes a research brewery. Of the national production, 79.2 percent (54.9 million pounds) comes from the Yakima Valley — mostly from farms around Moxee, Prosser and Toppenish. Climate, soil and length of sunlight hours were factors in the Yakima Valley becoming the premier hop growing region in the U.S., Mahony said. Another 12.3 percent (8.5 million pounds) is from Oregon’s Willamette Valley between Salem and Woodburn, and the remaining 8.5 percent (5.8 million pounds) is from the Caldwell, Idaho, area. Acres harvested in 2013 were: 27,062 for Washington; 4,786 for Oregon; and 3,376 for Idaho, for a U.S. total of 35,224. Those figures were up slightly from a June 1 forecast. Idaho is growing more rapidly in production and acreage than Washington and Oregon. That’s because Idaho has more acreage readily available for expansion while acreage is getting tighter in Washington and Oregon, Mahony said. Washington will have to expand hop picking and drying facilities in a couple of years to keep increasing acreage, he said. Oregon growers deal with more downey mildew because of the wetter Willamette climate but some varieties grow better there, Mahony said. Prices are stronger in Washington and Oregon at $3.68 per pound versus $2.64 per pound in Idaho. That’s because Washington and Oregon have more of the expensive aroma varieties for flavoring and Idaho has more alpha varieties for bitterness, Mahony said. Harvested hops can be stored three to five years depending on whether it is stored in pellets, extract or further refinements of extract, he said.